There is a wholesale stock of SMARTMO balance wheels available in Miami, offered at a factory direct price of 99.00 USD per piece (take-all price). The hoverboards are new, available in several colours, also in big sizes.The offer has been listed by an import-export company from the United States. They have a stock of 6,480 pieces of balancing wheels made by a Chinese manufacturer. The items have RoHS, CE, FCC certification. They are operated by 4400mAh Lithium Ion Battery, which gives the devices a range of 15 to 25 km when fully charged. The charging time takes from 1-2 hours. Optionally, you can order Samsung batteries, which entails an additional cost of 17.00 USD added to any model. The hoverboards can reach the speed of 13-16km/H. Their maximum load is of 120kg. The product’s dimension are 584*186*178mm. The tire size is 6.5 inch. There are also big size models with 8.5 inch or 10 inch tires. The best price for the whole stock of 1,620 pieces (1x40HQ container) is $99.00 CIF – ASWP. The price for a 20ft container including 500 to 700 pieces is $104.00 CIF – ASWP. The price for 820 pieces is $129 / piece. The price for 400 pieces is $135.00 / piece. 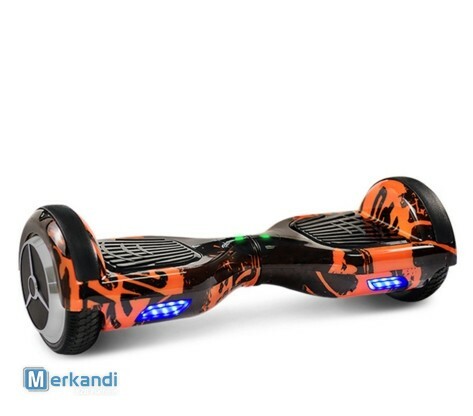 The minimum order quantity is 500 to 700 hoverboards. All the prices include shipping up to final destination sea port. Delivery time to the Port: 15-19 days after placing an order. More photos and information about the available colours and models in the attachment in this link.